Regular readers will be aware of how fond I am of Mr Bs Emporium of Reading Delights in the City of Bath. However, up until Tuesday night of this week, I had yet to attend one of their author events. I had been waiting for the right author to visit the bookshop itself, not one of the larger venues where events are sometimes held. Marcus Sedgwick, whose writing I adore, was a perfect fit. The ticket had seemed a little pricey but included music, wine, a plentiful and delicious wintry feast, and a 15% discount on all purchases made on the night. For a full evening of such congenial entertainment it turned out to be excellent value. The size of the bibliotherapy room ensured that this was an intimate gathering, and Marcus was happy to mingle while supper was eaten. Attendees were welcomed with a glass of wine and invited to browse the shelves before moving upstairs for the main event. This opened with music by The Bookshop Band who performed a specially written song about Snow. If you haven’t heard of these guys then do look out for them. They set the scene beautifully for a cosy and entertaining evening. Marcus was there to discuss a recently published monograph about Snow, the seventh in a series of nature themed books commissioned by Little Toller Books. He talked briefly of the work that this small publisher supports, how they have recently opened an art gallery in Devon and offer residencies to artists in the Toller valley. This helped explain the gorgeous look and feel of the book. I was privileged to have been sent an early copy – you may read my review here. Marcus now lives full time in the French Alps, at a height equivalent to the peak of Snowdon. He talked of how science has proved that the natural world has health benefits, how exercise outside is more beneficial than in a gym, and how hospital patients on the sunny side of a hospital ward respond better to treatment. Our emotional response to natural events remains childlike throughout our lives. We point out a rainbow, a sunset, heavy rainfall or a covering of snow. Businesses monetise this when they charge more for a room with a view. As well as the science of snow, Marcus talked of its inclusion in literature. He mentioned his favourite book, The Magic Mountain by Thomas Mann, which is set in and around a sanatorium in the Swiss Alps. Living where he does he understands the pleasure of the rarefied mountain air and the introspective world he can enjoy in such a remote location. Marcus talked of his interest in etymology and the century long debate over how many words the Innuit people have for snow. He pondered why the early explorers to the poles chose to risk their lives to bag a world first, and how only now are some of their remains being located. The indigenous people could have shared this knowledge much earlier but few were willing to listen, convinced as they were of their own superiority. There was mention of climate change, of how much less snow now falls, how when it does there is a muffling of the regular world as a cleansed pallet is offered. It is also, of course, a danger. The music of Schubert evokes this darkness. There were many more questions but much of what Marcus revealed is covered in the book which I recommend you read. He writes so beautifully and this is obviously a subject close to his heart. The evening ended with a signing and I was delighted when Marcus drew a little snowflake in my book. He is a warm and fascinating speaker. This was a special event. Snow is published by Little Toller Books and is available to buy now. Today I am over at the Insider’s Guide, the blog for Visit Bath – The Official Tourist Information Site for Bath Tourism. I am writing about ‘why the city is perfect for bookworms’. 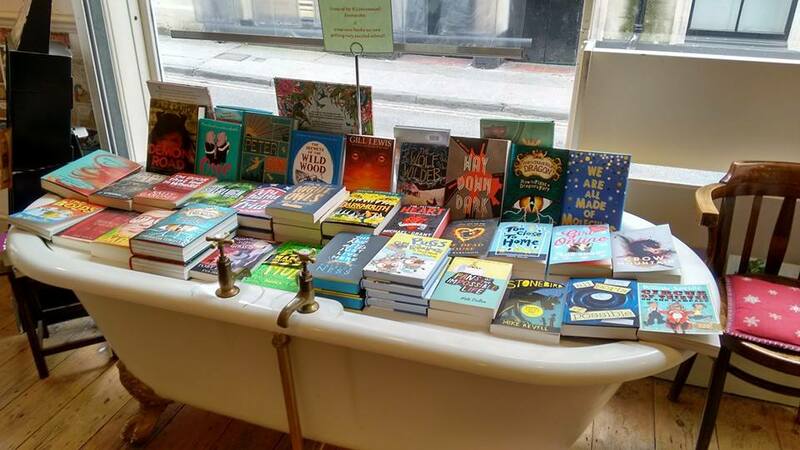 You can pop across to check out my post by clicking on this link: Bath is for Bibliophiles!